(Universal Music Company) Rob Zombie is probably a very nice guy, but his stage persona is uniquely terrifying. 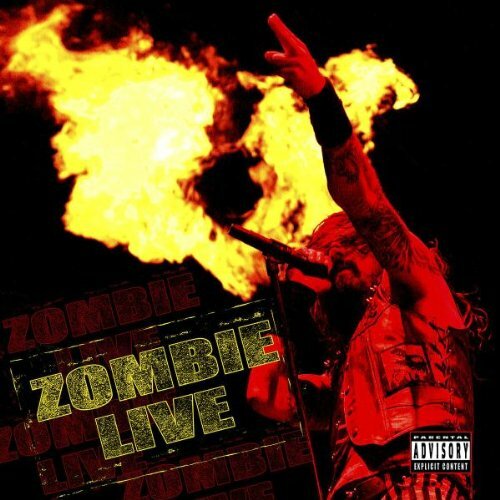 Truly a disc to scare small children, LIVE by Rob Zombie is a greatest hits sort of effort that really shows what a big deal Zombie is to a lot of people. As much as Rob himself can fill the britches of the terrifying, the fans that mob his concerts are just as formidable. That is why I am sort of glad there is a live disc like this, so I can peek nervously through the lower porthole of the ZEII, from the safety of the pier. “Do you love it when the guitar’s screaming?” No, Rob. Well sort of. Okay, I love it. But I love my soul more, so no deal! I’ll keep my peaceful time with the sheep over a more severe, thrashing jaunt through goat hell, Rob, despite the chance to scream and perhaps spit a little bit at the man. But that’s just me. If anything, the whole experience is a sort of uplifting but still negative kind of music assembly, a huge collective simultaneously deciding to act like maniacs in a controlled environment. It’s brash and compressed to the max, but you can still hear the message loud and clear, and the fans love it. The live show is an impressive recording, and Rob Zombie himself is a real ringleader to all of his minions, keeping them fulminating. It’s like 10,000 puppies and a gargantuan chew toy just out of reach. This is a great live disc with the gamut of Zombie hits, varying in popularity from “obscure” to radio. There are even some gentle melodic moments to lull you temporarily before Rob really sinks his teeth in. By all means, takes it all in and enjoy, and for you percussion train-spotters out there, that’s not a new type of cowbell that Tommy Clufetos is playing, it’s a severed head.